Greetings from Bill Johnson (professional "handle" M. W. Johnson, Ph.D.) in Los Alamos, New Mexico. I use the same user name in Wikipedia, where I contribute articles on New Mexico, classical music, mountains and mountaineering, and chess -- in other words, a lot of the same stuff as here. (Incidentally, Los Alamos is widely known as "The Hill," hence the handle.) I'm 58 years old, married, with two children starting grad school. 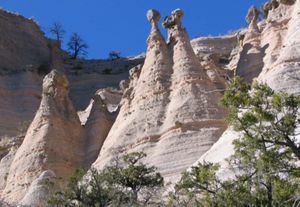 If you have questions about hiking opportunities in New Mexico or suggestions for WikiTravel articles on the area, drop me a line! Bloomington-Normal (Illinois) -- My old stomping grounds many years ago, and worth a little effort as they're on Route 66 which is a trendy "meta-destination." I've started the process of combining the old Bloomington and Normal articles; please feel free to help. Santa Fe (New Mexico) -- The "City Different" can't really be "completed" as a destination, as it's constantly changing, but most of the heavy lifting is done. Note that I've set up a photo page with photographs of this extremely beautiful place, with the intention of using one or more in the article once there's been some discussion; if you particularly like (or dislike) one, please leave a comment in the corresponding discussion page. I'll also kick in on some destinations in Arizona and Colorado, although my knowledge of these is somewhat more superficial. A possible topical page on Folk Art, to bring some rigor to the hodgepodge of American Indian art mentioned in some of the other pages, and try to encourage other areas with interesting folk art to represent it coherently. If you want info on these, for the time being I recommend you simply leave a message on my Talk page, as my e-mail is flaky and I only participate rarely in IRCs. Watch this space, as it's still a goal of mine to reach all fifty -- yes, including Denali (Alaska). Other sources of folk art beyond those of the Southwestern United States and Russia. I think we really need an article on this subject; planning to get started on it soon. This page was last edited on 21 April 2012, at 02:33.